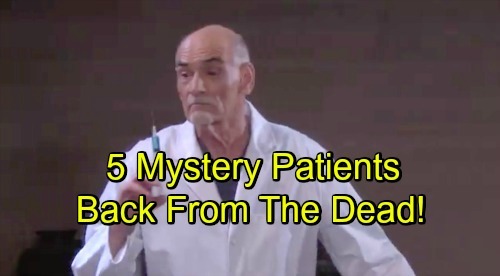 Days of Our Lives Spoilers: 5 Other Mystery Patients Back From The Dead – Who Else Is Alive and Could Haunt Salem? Days of Our Lives (DOOL) spoilers tease that more back-from-the-dead mysteries will unravel. After getting the upper hand on Xander (Paul Telfer), Nicole went looking for Eric (Greg Vaughan). She stumbled across some top-secret rooms at the warehouse, so let’s unpack what we saw. DOOL fans have noticed the “E.D.” label on what we assume is EJ DiMera’s (last played by James Scott) door. Since the door had to be marked, viewers started to wonder if there were other mystery patients at the facility. It turns out there are several! Five other sets of initials were spotted, so we can pair them up with dead Salemites and see who was brought back to life. For starters, there was “S.D.” That’s undoubtedly Stefano DiMera (Joseph Mascolo). Since Mascolo passed away, he obviously won’t be reprising the role. Mascolo was adored by many soap watchers, so Days would be wise to steer clear of recasts as well. Still, it’s a nice way to confirm Stefano pulled through. He seems like one of those characters who should just be…out there…somewhere. The great Stefano DiMera can never truly die! Next, we’ve got “W.R.” Those initials most likely stand for Wilhelm Rolf, the DiMera family’s twisted doctor. He’ll be back from the dead on this week’s new Days episodes, October 22-26, which makes sense considering Dr. Rolf’s the serum mastermind. Dr. Rolf must’ve spent some time behind that door before reopening his lab. The initials “V.A.” were also featured. That lines up with Vivian Alamain (Louise Sorel), who was shot dead and injected before being whisked away. We saw her on the mend afterward, so she wasn’t too far gone. Will Vivian return for revenge on Kate (Lauren Koslow)? Time will tell, but it’s worth mentioning that Sorel wasn’t happy with her last stint. She doesn’t seem too interested in a comeback. “A.D.” is almost certainly for Andre DiMera (Thaao Penghlis). Penghlis will actually reprise his role this week for a Halloween nightmare, but he should be back in the flesh down the road. Finally, Days of Our Lives fans saw “A.V.” Those initials are probably referring to Ava Vitali (Tamara Braun). Braun’s currently playing Kim on General Hospital, but she may not stay over there forever. It’s smart to leave the door open for evil Ava. After all, Days will want Joey (last played by James Lastovic) back in some form eventually. He strangled Ava on screen, but a DiMera minion must’ve come along and revived her. This could get Joey off the hook for murder and earn him his freedom someday. An explosion is set to blow up the facility, but Kristen (Stacy Haiduk) should get the patients out of there first. We can’t have Salem’s undead being blown to smithereens! Days of Our Lives spoilers say some hot drama’s coming up, so we’ll give you updates as other news comes in. Stick with DOOL and don’t forget to check CDL often for the latest Days of Our Lives spoilers, updates and news.